The UK's tax authority has made a final appeal to contractors facing the controversial loan charge to settle ahead of an imminent deadline. The 2019 loan charge is aimed at tackling a type of employment tax avoidance the authorities call "disguised remuneration". 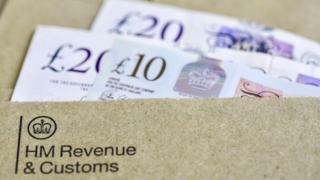 Instead of facing a large tax bill in one year, HM Revenue and Customs says people can settle and spread the cost. But many of those facing the charge argue that it is unfair. Some say they face "financial ruin" as a result, and an influential Lords committee said it had heard "disturbing evidence" about HMRC's approach. MPs are debating the topic on Thursday, and there have been calls for a delay to the charge - which effectively comes into force on Friday. Under these schemes, an estimated 50,000 workers - mostly contractors - were paid by way of a loan, an arrangement that was intended to avoid tax and National Insurance contributions. HMRC said it never approved these schemes and had always said they did not work. The charge will add together all outstanding loans, over the course of up to 20 years, and tax them as income in one year. Those affected will have to pay by the end of January next year. There has been criticism of the fact that the charge can be applied retrospectively, but HMRC said that anyone settling - or declaring an intention to settle - before a deadline of the end of Friday could spread the cost of the unpaid tax. Anyone earning less than £50,000 and who no longer uses such tax avoidance schemes can spread the cost over a minimum of five years. Anyone earning less than £30,000 can spread the cost over a minimum of seven years. HMRC said it would not force anyone to sell their home to pay the tax debt. "We are appealing to those who haven't come forward to settle their disguised remuneration debts to do so now," an HMRC spokesman said. One case presented to the Lords committee concerned a social worker who was made redundant by her local council. "She was re-engaged as a contractor for five years but at the end of the five years, the council told her it would re-employ her as an employee, which it did. "She was unaware of what was going on. She now faces a loan charge equal to probably a year and a half's salary. "She has no means of paying it." The Loan Charge Action Group has called for the charge to be forward-looking rather than retrospective, arguing that by going back 20 years, HMRC is demanding huge tax bills for arrangements that were openly declared to HMRC at the time. Meanwhile, there have been calls for a delay in the introduction of the loan charge. Dawn Register, partner in tax dispute resolution at accountants BDO said: "This controversial tax charge has not received sufficient Parliamentary scrutiny. "With MPs' time dominated by Brexit it is hardly surprising, however the flurry of evidence and activity in recent weeks suggests that more time is needed to consider the impact of the measure."